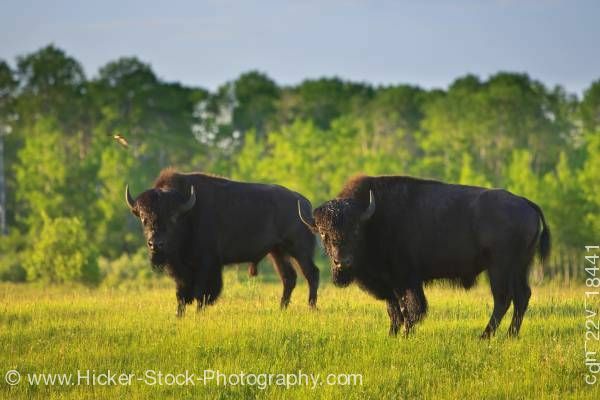 Stock photo of two magnificent bison standing in a field where they are free to roam in the bison enclosure in Riding Mountain National Park, Manitoba, Canada. This stock photo shows two large adult bison in a field of yellow and green grasses, roaming freely in the Bison Enclosure in Riding Mountain National Park, Manitoba, Canada. Riding Mountain National Park in the southwest corner of Manitoba is the protected core of the UNESCO designated Riding Mountain Biosphere Reserve. It’s an area focused on conservation and sustainable resource. The Riding Mountain National Park includes the rustic charm of the town of Wasagaming, lakes, trails, and nature. Outside the park but within the biosphere are cultivated areas, farms, livestock. The goal is to protect the biodiversity of the biosphere, and to use the resources wisely to promote the long term health of the region plants and animals.